Available sizes- 4.25”, 6”, 8”, 6”x8”, 8”x10”and 12”. The ceramic tiles are standard wall tile thickness of 1/4". The ceramic tiles have built in spacers that separates the tile 1/16”. Ceramic gloss tiles lend themselves to a modern and contemporary look and feel. These tiles have a very shiny finish. The images on the high gloss tiles are bright and vibrant. The glossy tiles are fine for any kitchen backsplash or bathroom installation, but they can let off a glare with your overhead lighting. 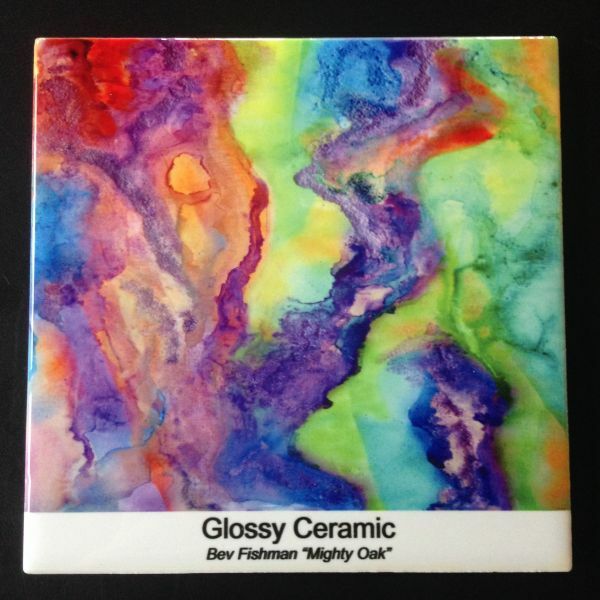 If you are using a gloss tile or glossy glass tile for your surrounding tile then you might want to consider the high gloss tiles for your tile mural. Glossy Dal-Tile or American Olean ceramic tile are a good match for field tile with these. Just one word of warning the gloss ceramic tile has a softer finish than our other tiles and tends to scratch easier. Please use extra care when installing and cleaning this tile. Any spray or foam cleaners with a soft cloth or sponge are fine for cleaning. We recommend using non-sanded grout for installation. Available sizes- 4.25”, 6”, 8”, 6”x8”, 8”x10”and 12”. The ceramic tiles are standard wall tile thickness of 1/4”. The ceramic tiles have built in spacers that hold the tiles apart by 1/16". When choosing ceramic tiles for your project, the most popular finish and the finish we recommend most is the satin finish. 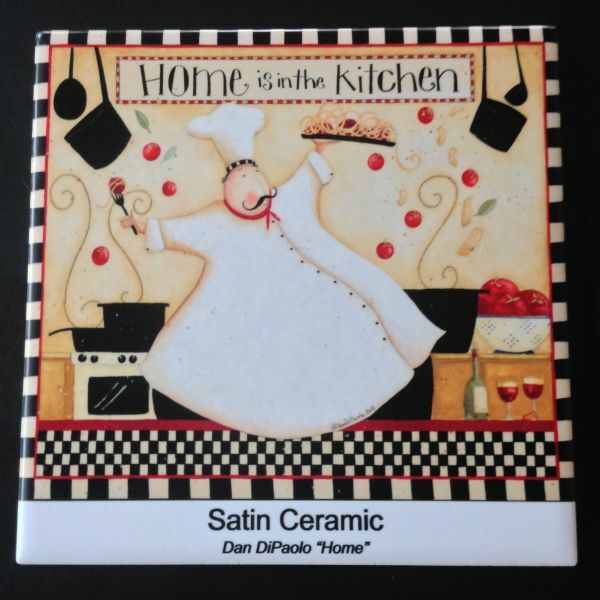 Ceramic satin tiles can be used for a contemporary or traditional theme. These tiles have a slightly shiny finish, but won’t let off a glare from your kitchen or bathroom lighting while showing off colors beautifully. Our satin finish tiles are standard Dal-Tile or American Olean ceramic tile so they are an easy match for store purchased ceramic tile. The satin finish ceramic tiles blend well with any field tile you choose, whether it is ceramic or a natural stone. Any spray or foam cleaners with a soft cloth or sponge are fine for cleaning. We recommend using non-sanded grout for installation. Available sizes- 5 7/8" x 5 7/8" (called 6” x 6”) and 3 7/8" x 3 7/8" (called 4” x 4) the thickness is 5/16”. The tumbled porcelain tiles (Rialto tile) are perfect for any indoor wall application and are perfect behind your cook top or in the bathroom as part of your shower/tub surround. The tumbled porcelain tiles give the look of natural stone to your tile project without the work of sealing it. The tumbled porcelain tile is sold as Rialto tile by most Lowe's Home Improvement stores throughout the Country. These tiles have a slightly textured with small pits and crevices on the face but the sides of the tiles are straight with rounded corners. The Rialto Porcelain tiles give your tile project an "Old World" or "Tuscan" feel. The Rialto tumbled porcelain tiles have a satiny finish that really show colors off nicely but still give you a rustic look. These tiles are suitable for any indoor wall installation and they may be installed outdoors in heavily shaded areas only. Available sizes- 4” and 6” and are 5/16" thick. The tumbled marble tiles are perfect for any indoor wall application and are fine for use behind your cook top or sink. The tumbled marble tiles are a natural stone and therefore they are porous and need to be sealed before you install them and then periodically thereafter. Choose the tumbled marble tiles when you want a true natural stone for your tile project. The tumbled marble stone tiles have distressed edges and corners and a matte (stone-like) finish. Because these tiles are not manmade, each tile will be different in color, veining and surface pitting. It is normal to have corners that are chipped and ragged and some can be very distressed. It is also normal for some of the natural veining and shade variations of the tiles to show through the mural image. This is most evident when there are very light or white colors in an image such as clouds in a landscape piece. The colors of your tile mural will appear somewhat muted and toned down when using the tumbled marble tiles. All these characteristics are what give the tumbled marble stone its appeal. You can match our tumbled marble tile with any natural stone field tile from your local tile store to complete your tile project. Available sizes- are 6” and 12” the thickness of the glass tile is 3/16”. Our textured glass tile has a rippled (pebble like) texture to the surface of the glass. Its a very unique look, while still offering loads of vibrant color. The image is applied to the back of the tile and you see the image through the glass. Colors are nice and vivid on this tile and the image never wears off since it is on the back of the tile therefore they are great for countertops and heavy traffic areas. The Textured glass tiles are rated for flooring. These tiles come in 6” and 12” tiles. This is the most durable tile finish available for a ceramic tile. It is rated for use for most light traffic floor applications. It is also great for use on countertops, table tops and bar areas. Next to the kiln fired tiles this is the most scratch resistant of all ceramic tiles. It has a slight orange peel texture to the surface which adds slip resistance when used on floors. 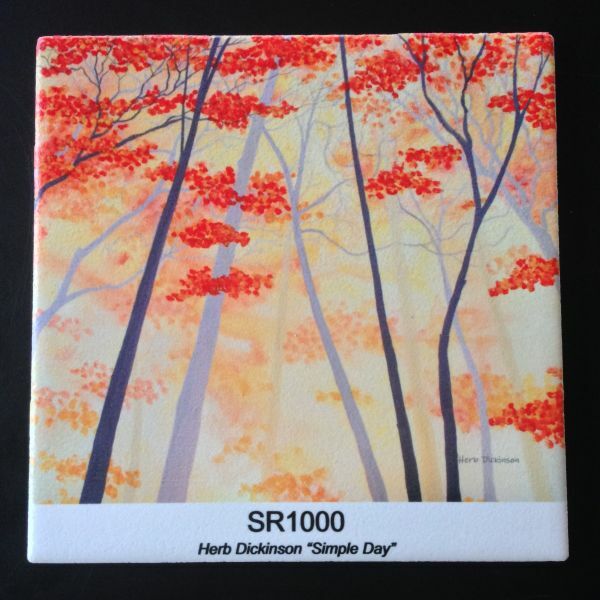 This is the tile we would recommend using in an outdoor setting that gets sun during the day. These are full bodied porcelain tile and can be used in fountains and pool surrounds. These are a high gloss smooth finish. They will liven up any garden or sitting areas outside. Or maybe use one to decorate a retaining wall, or for you’re built in fire pit or outdoor fireplace to add a bit of interest. We do custom images too. 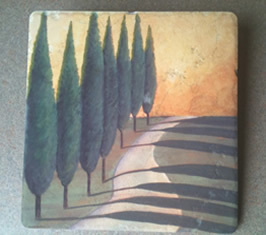 The kiln fired tile murals are a bit more involved to produce so please allow about 4-8 weeks for production. Available sizes: 8"x11" and 12"x15". 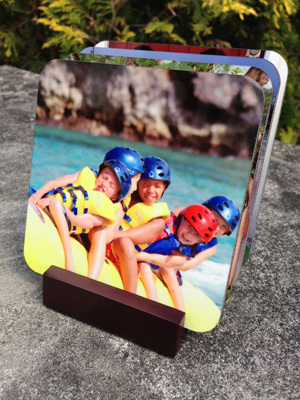 Our cutting boards provide a great way to bring your favorite piece of art or image to your kitchen. Our tempered glass cutting boards are 100% made in the USA and completely dishwasher safe. 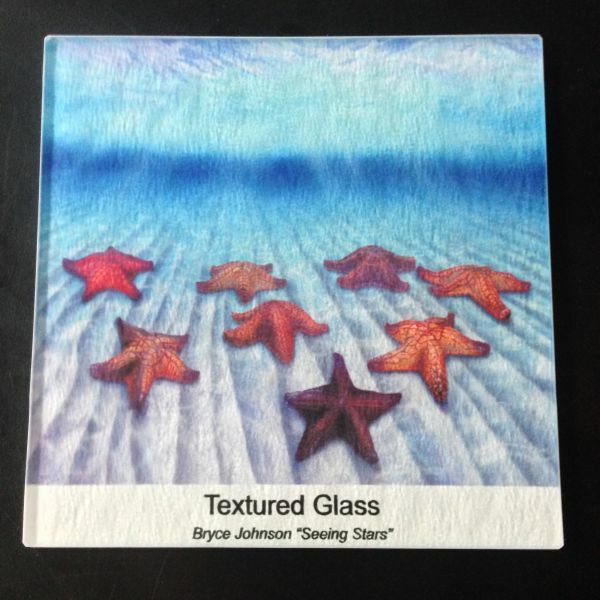 Similar to our textured glass tiles, the image is applied to the back, non-cutting side. Also attached to the back are 4 rubber feet to hold the board in place while in use. Just like our tile murals, we would be happy to make you a custom cutting board with your own image. Great for gift giving! 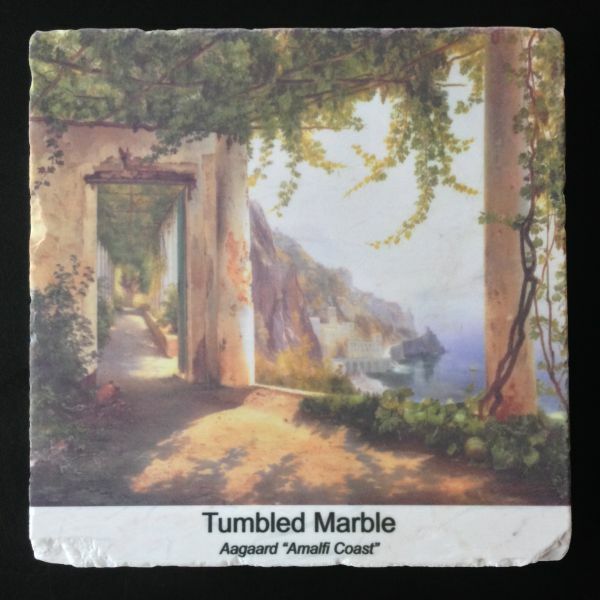 Our tumbled porcelain coasters are 4"x4" and feature rounded edges, natural veining, and cork backing. These pieces are perfect if you want a more 'rustic' look. Available are beautiful mahogany racks... perfect way to keep your coffee table organized! 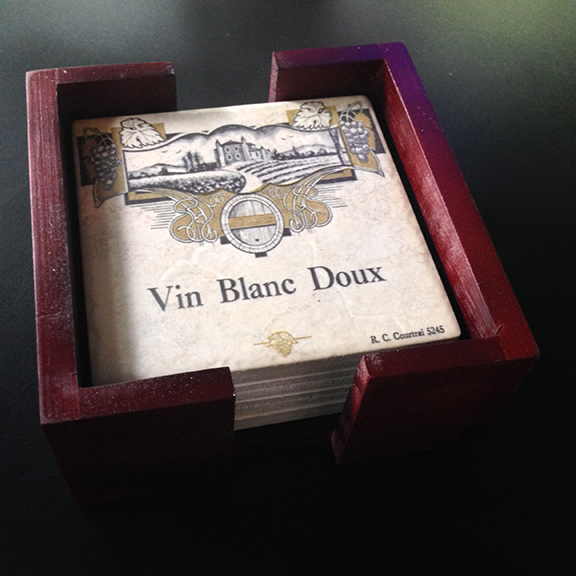 Our hardboard coasters are 3.75"x3.75" and feature rounded edges, built in cork backing, and a semi-gloss finish. Available are Mahogany racks that also act as a nice display! Note! If a tile type has a * next to it, this indicates that it is special order material. Please contact us for pricing and availability.